Walter Browne is a living legend of chess. A hurricane of a player with a daredevil approach of the game, he was and is famous for ending up in hair-raising time-trouble. During the peak of his career, in the 1970's and 80's, he won the US. championship six times as well as countless national and international tournaments. In this memoir Walter Browne recounts his formative years, how he befriended and played Bobby Fischer in New York City, how he travelled the world and made his name. He annotates his best games from over four decades, great attacking games full of sacrifices and fireworks, in a clear style tht is accessible for amateur players. Chess is not the only game Browne excels in. He is also an avid backgammon and scrabble player. His career in poker is almost as impressive as his chess feats. Having started to play long before the recent surge in popularity of the game, he is a regular competitor in the World Series of Poker in Las Vegas, and has pocked hundreds of thousands of dollars in poker wins. 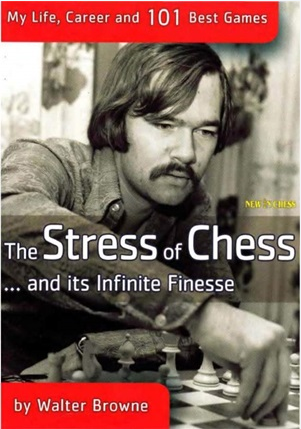 The Stress of Chess is the fascinating story of the life and career of a unique and unorthodox player. Photographs throughout.